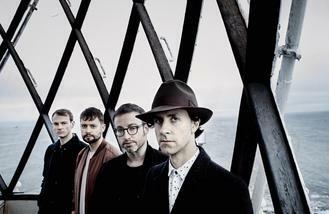 Maxïmo Park have announced their sixth studio album 'Risk To Exist'. The 'Apply Some Pressure' rockers first album since 2014's Top 10 record 'Too Much Information' is a politically-charged record filled with "great pop melodies" about the state of the "British nation" and the dire state of world affairs last year. Frontman Paul Smith said: 'The album is, ultimately, about empathy. Some songs are simple messages of solidarity and others are fuelled by anger at the elitist, established order of British society. There's a questioning of power throughout and a feeling that there must be a different way of structuring our society in order to alleviate inequality. "Musically, the songs reflect more soulful and groove-based influences, allowing more space in the arrangements than ever before. The central idea is to align great pop melodies with songs that reflect the state of the nation." 2014's Top 10 'Too Much Information'. The indie rock group - also comprised of Duncan Lloyd Archis Tiku, Lukas Wooller and Tom English - recruited Mimi Parker from acclaimed US band Low for the record, who recorded the vocals on five of the album's tracks, including lead single 'Risk To Exist'. Asked if the track is a good indicator of what to expect from the rest of the record, Paul told Radio X: "Not really. It's a bit of a red herring, but we wanted something that bridged what we'd done before with what's on the album." 'Risk To Exist' is released on April 21. Clean Bandit had "problems" that almost led them to split. Paul Young used to take Rohypnol to wind down after concerts. One Direction star Louis Tomlinson and actress Danielle Campbell have reportedly split after 14 months of dating. Rita Ora’s next song will be part of the new Fifty Shades of Grey movie. Geri Horner has given birth to a son. Ed Sheeran has such an extensive collection of teddy bears they fill a whole room. The Little Mix girls don't seem fazed by the backlash their new raunchy video is getting. Stereophonics have hinted that they've finished working on their 10th studio album. Britney Spears has opened up about her new man, calling Sam Asghari "really cute" in a new radio chat.